I thought I’d post here a few quotes in favor of the concept of progression/regression between kingdoms. I began to look up all the quotes until I discovered that the folks at the New Cool Thang blog had already done all the hard work. I reproduce the quotes here for my own benefit so I can always find them in the future when the need arises, giving the credit to others for finding them. You that are mourning about your children straying away will have your sons and your daughters. If you succeed in passing through these trials and afflictions and receive a resurrection, you will, by the power of the Priesthood, work and labor, as the Son of God has, until you get all your sons and daughters in the path of exaltation and glory. This is just as sure as that the sun rose this morning over yonder mountains. Therefore, mourn not because all your sons and daughters do not follow in the path that you have marked out to them, or give heed to your counsels. Inasmuch as we succeed in securing eternal glory, and stand as saviors, and as kings and priests to our God, we will save our posterity. When Jesus went through that terrible torture on the cross, He saw what would be accomplished by it; He saw that His brethren and sistersCthe sons and daughters of GodCwould be gathered in, with but few exceptionsCthose who committed the unpardonable sin. That sacrifice of the divine Being was effectual to destroy the powers of Satan. I believe that every man and woman who comes into this life and passes through it, that life will be a success in the end. It may not be in this life. It was not with the antedeluvians. They passed through troubles and afflictions; 2,500 years after that, when Jesus went to preach to them, the dead heard the voice of the Son of God and they lived. They found after all that it was a very good thing that they had conformed to the will of God in leaving the spiritual life and passing through this world. Lorenzo Snow, MS 56:49-53; Collected Discourses 3:364-65. B. H. Roberts, New Witnesses for God 1:391-392. Some years ago I was in Washington, D.C., with President Harold B. Lee. Early one morning he called me to come into his hotel room. He was sitting in his robe reading Gospel Doctrine, by President Joseph F. Smith, and he said, â€œListen to this! 5 Comments Posted in . Last weekend was the 183rd Annual General Conference, and as always it was a wonderful experience. 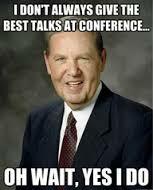 I consider General Conference a minor Mormon holy weekend, coming twice a year at the same time. It is a time for families to sit together and “pitch their tents round about the temple“, as it were, to listen to the prophets of God. Nowadays we sit on couches and watch it on cable and satellite TV, which I rather enjoy. For many who are interested in apologetics there were many good talks to draw from, but one of them far and away stood out from the rest. 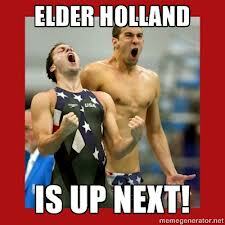 It comes as no surprise that it was delivered by Elder Holland. There are so many quotable lines from his talk, but below are a selection of them. Please take the time to read the talk in its entirety (it isn’t very long) and also watch the video of his delivery (at the end of this post), which adds a whole other dimension to his words. In moments of fear or doubt or troubling times, hold the ground you have already won, even if that ground is limited….When those moments come and issues surface, the resolution of which is not immediately forthcoming, hold fast to what you already know and stand strong until additional knowledge comes. When problems come and questions arise, do not start your quest for faith by saying how much you do not have, leading as it were with your “unbelief.” That is like trying to stuff a turkey through the beak! …please don’t hyperventilate if from time to time issues arise that need to be examined, understood, and resolved. They do and they will. In this Church, what we know will always trump what we do not know. And remember, in this world, everyone is to walk by faith. Except in the case of His only perfect Begotten Son, imperfect people are all God has ever had to work with. That must be terribly frustrating to Him, but He deals with it. So should we. A 14-year-old boy recently said to me a little hesitantly, “Brother Holland, I can’t say yet that I know the Church is true, but I believe it is.” I hugged that boy until his eyes bulged out. I told him with all the fervor of my soul that belief is a precious word, an even more precious act, and he need never apologize for “only believing.” I told him that Christ Himself said, “Be not afraid, only believe,”…I told this boy that belief was always the first step toward conviction and that the definitive articles of our collective faith forcefully reiterate the phrase “We believe.” And I told him how very proud I was of him for the honesty of his quest. What was once a tiny seed of belief for me has grown into the tree of life, so if your faith is a little tested in this or any season, I invite you to lean on mine. The invitation to us to lean on his testimony in moments of doubt was an especially powerful line to me. It is, for me, the epitome of the role of an apostle. Conclusion: Joseph was not a rogue. 1 Comment Posted in . It’s been a while! My wife gave birth to a set of twins about 6 weeks ago, so you can excuse me for putting blogging and research on the back-burner for a while. It still is, really, for the foreseeable future. However, I wanted to just make a few remarks about all the great research that is out there right now. Finally, my studies lately have led me somewhat into the weeds of early Mormon polygamy. It is a topic I have so far avoided blogging about. Expect some notes on those topics in future posts. One of the more controversial passages of scripture found in the Book of Mormon is 2 Nephi 25:23. 23 … for we know that it is by grace that we are saved, [in spite of/even after/apart from] all we can do. In other words, they argue that Nephi’s use of the word “after all” should be understood in the sense of “after all that we’ve done, we still need God’s grace”. I personally am a bit unsure as to whether this is what Nephi really means. I worry that, perhaps, Millet and Robinson are too influenced by the Evangelical scholars they love to dialogue with (to the benefit of us all). It certainly is a valid perspective, but is it right? Rather than argue against their perspective I want to share an alternative one. Actually, it really isn’t an alternative one but perhaps it can be seen as a complimentary facet to their take. I’ve wondered whether it is best for us to remember that Nephi is speaking from the perspective of one bound to follow the Law of Moses. This passage stands at the beginning of a short exposition by Nephi of the relationship between the Law of Moses and Christ’s grace. It may be appropriate to consider 2 Nephi 25:23-30 as one literary unit, or a small aside by Nephi in which he struggles to explain the relationship between the Law of Moses and the grace of Christ. Verse 23 stands at the beginning of this exposition, and serves as an introductory summary of what is coming next. I want to suggest that, perhaps, “all we can do” is a reference to the Law of Moses. (B) after all we can do. (B) we keep the law of Moses, and look forward with steadfastness unto Christ, until the law shall be fulfilled. I’m not a scholar of Book of Mormon parallelisms, but I wonder if my restructuring of the text above might be appropriate to illustrate what Nephi really means. It is quite easy to see how “all we can do” in verse 23 refers to “keep the law of Moses” in verse 24. Nephi, speaking from the perspective of an ancient Israelite who is bound under the Law of Moses, is struggling to reconcile the need for the Law of Moses with the grace of Christ. He is wrestling with this issue long before Paul ever did. Nephi arrives at the conclusion that the Law of Moses is meant to help Israel look forward with steadfastness to the coming of Christ (vs 24). If 2 Nephi 25:23-30 is taken as a literary unit, and if verse 23 is an introductory summary, then verses 29-30 can be read as a parallel final summary of Nephi’s point. What does it mean for us? It is tempting to see the phrase “after all we can do” to be specific only to Nephi’s doctrinal dilemma, not our own. Nephi is thinking specifically about the relationship between the Law of Moses and Christ’s grace. We don’t really grapple with that specific issue in this dispensation, and so this particular passage may not be totally applicable to us in the same way it was applicable to Nephi and his people. In other words, what I am suggesting is that when someone accuses the Latter-day Saints of having a “works based” soteriology because of this passage, we may be able to point out that this is Nephi speaking from a perspective that is mindful of the Law of Moses which has since been fulfilled in Christ. Our Evangelical friends should understand this, in theory, because Evangelicals very frequently talk about New Testament teachings superseding Old Testament teachings. They don’t consider themselves bound by Old Testament commandments that have no relevance in the New Covenant, and neither do we. That isn’t to say there is nothing of relevance in 2 Nephi 25:23 for us. As Latter-day Saints we do grapple with the relationship between modern day commandments (ie. tithing, word of wisdom, sabbath day, chastity, etc.) and Christ’s grace. Nephi’s thoughts regarding the Law of Moses can be transferred to our modern day struggles, to a point. The commandments point us toward Christ, and we perform the ordinances and keep the commandments because they are manifestations of Christ’s grace, and they lead us to him. Let us be careful to not mistake Nephi for an ancient Latter-day Saint. He wasn’t. He was an Israelite. Latter-day Saints are sometimes prone to forget that Nephi’s concerns were not always the exact same concerns that we have in this dispensation. Feel free to share your thoughts, and let me know if maybe my pain killers (from my surgery) are really the ones doing the talking. 16 Comments Posted in .